You want to do something really fun? Really cool? Really neat? Really beautiful? Really worth doing? Do you? Then work on bringing peace on earth. the moon to come and bring peace to us. It's not happening. We have to take care on our own, all of us. Because scientifically it's proven that for a vast distance in space, it’s nobody else, except us. So, start to like your neighbor, because you know what, you are stuck with them. one day there will be peace on earth. If we can go to the moon, then why not? It’s an old idea, I agree. 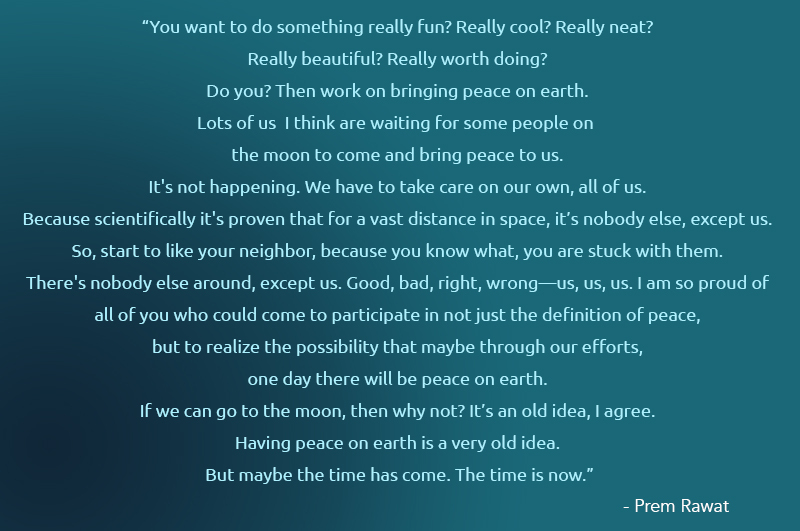 Having peace on earth is a very old idea. But maybe the time has come. The time is now.